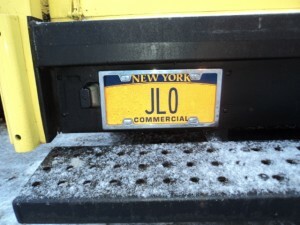 It is 2011. 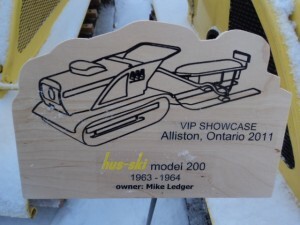 If you do the math and realize that the first Hus Skis rolled off the production line in 1961, 2011 is the 50th Anniversary of Hus Ski! Wow, 50 years of fun and the beginning of a product that has been such a gift to many of us. 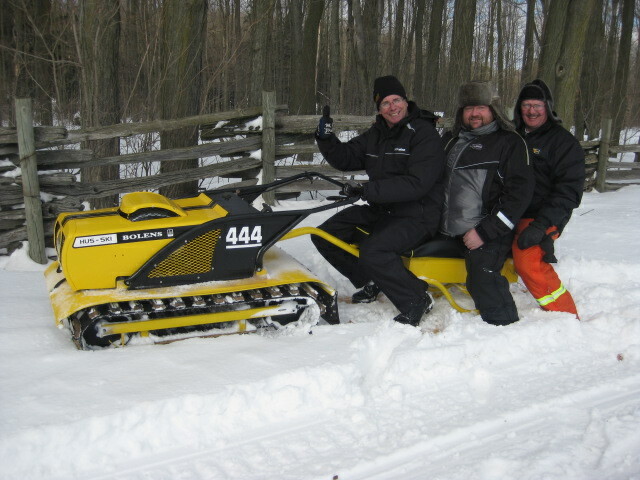 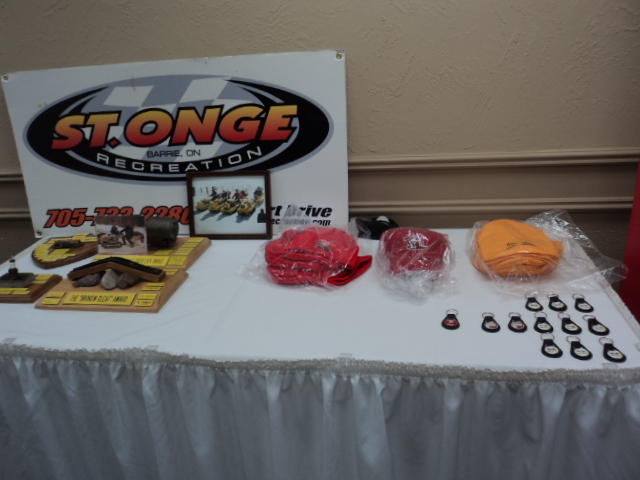 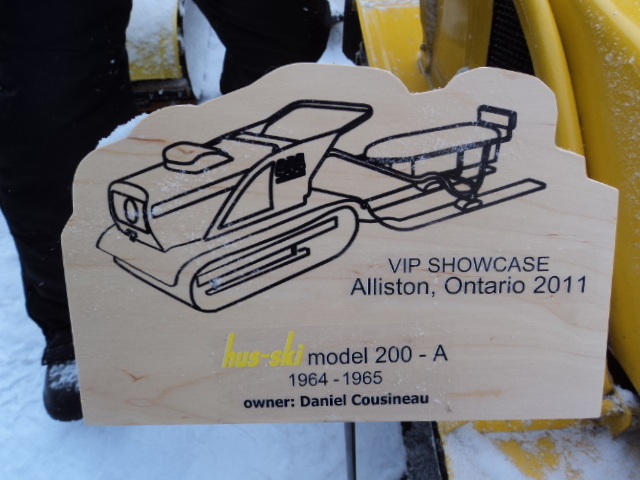 So it was fitting with the anniversary that Barrie Graham (who is our Hus Ski Hero) combined efforts with Shawn and Tracy to coordinate a Hus Ski / Diablo Get Together in conjunction with the Live on Skis Event in Alliston, Ontario. And what an event it was! 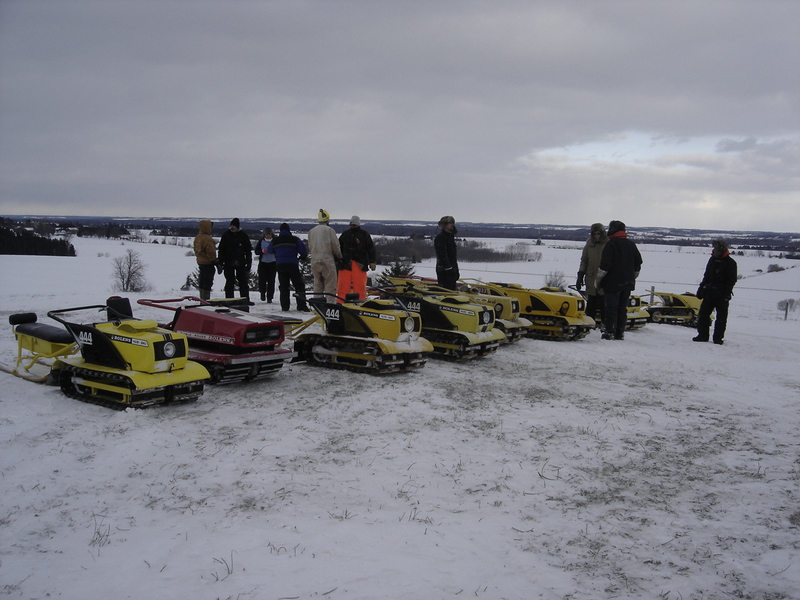 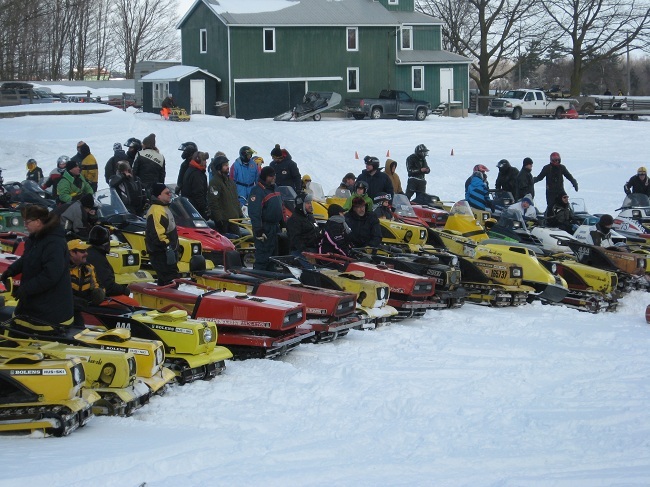 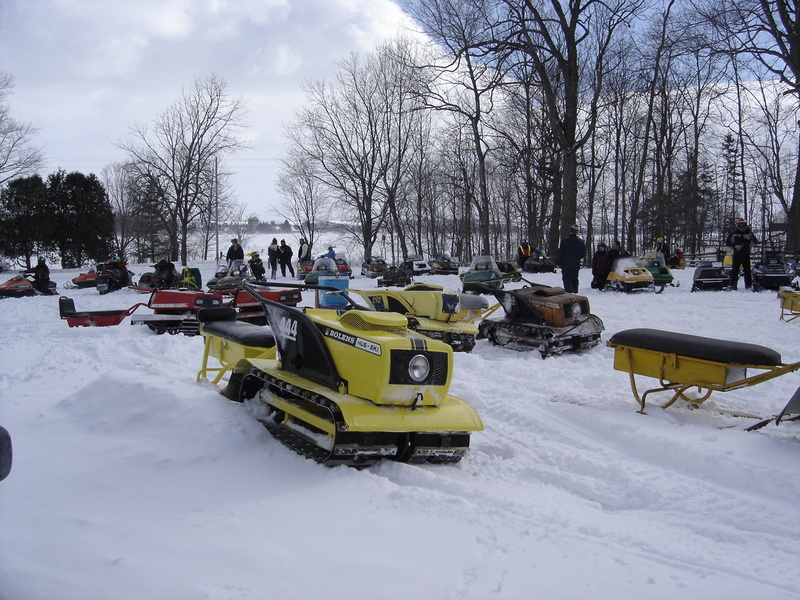 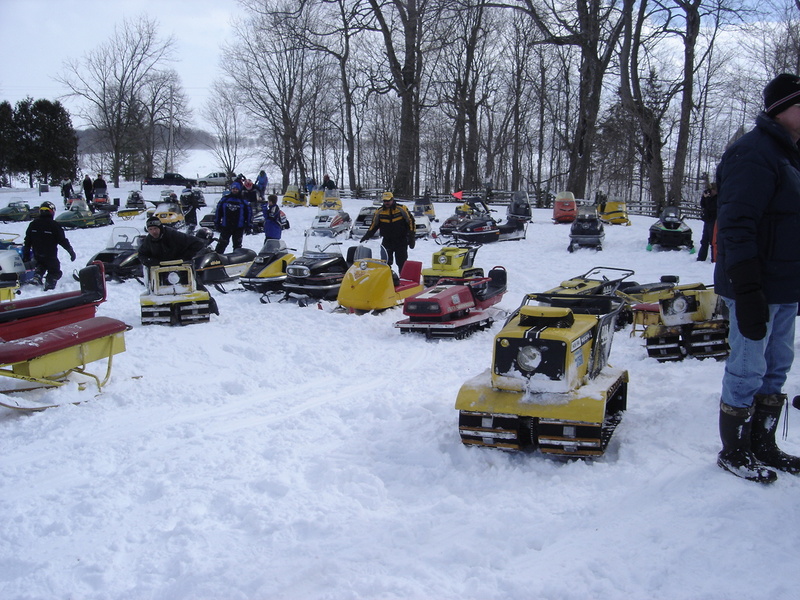 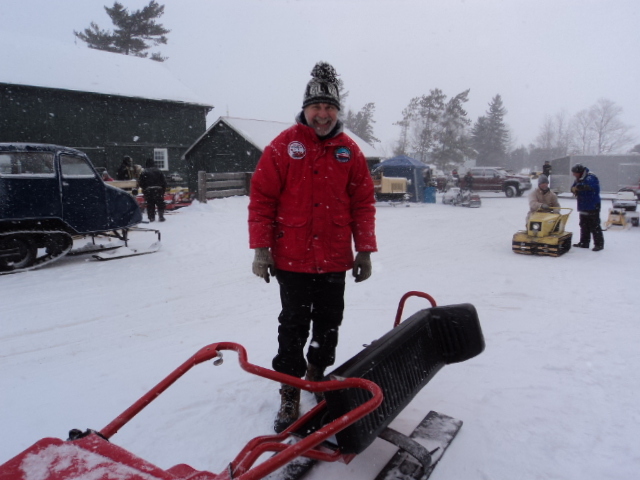 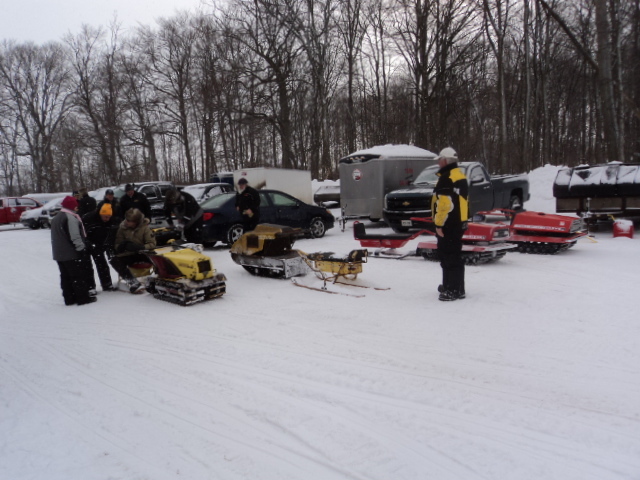 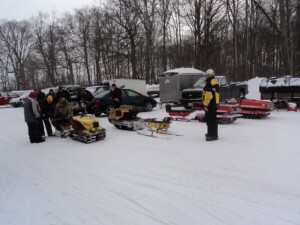 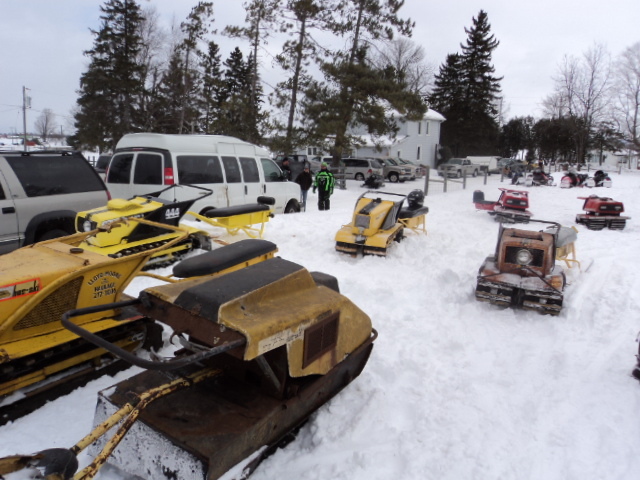 Whether you wanted to show your pride and joy, swerve through the slalom course, take a ride through the woods, race your sled in the radar run or just hang out and enjoy the day, this event was for you. 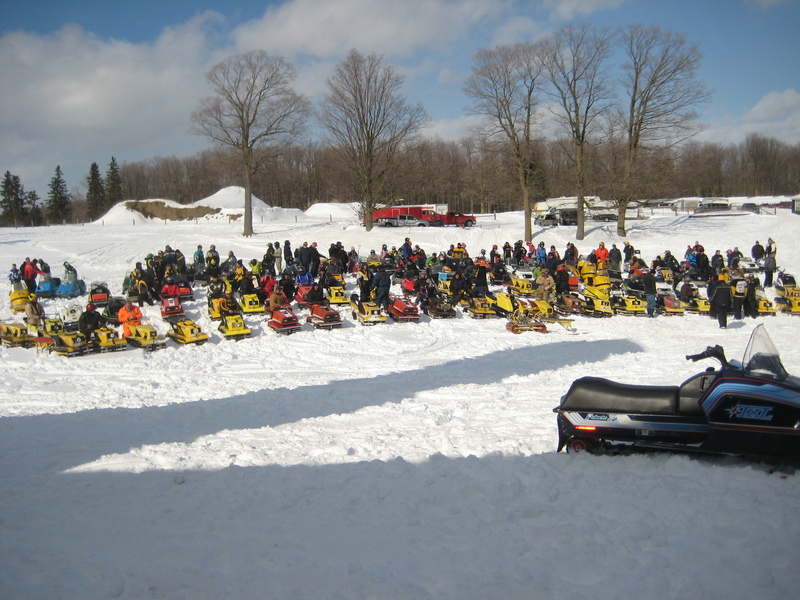 There was plenty to see and the day was a perfect one for such an event with a little fresh snow in the morning and warm temperatures later in the day. 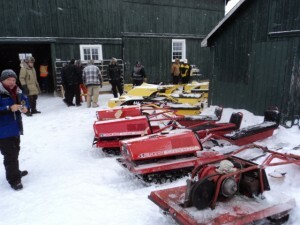 A few people brought their units in the night before and they were stored in the barn awaiting daylight. 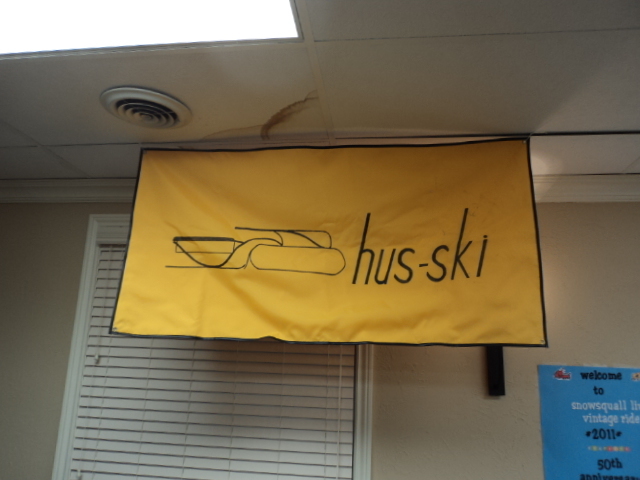 Barrie was found praying to the Hus Ski God for a good day to follow and although he wanted to stay in the barn all night with his flock, we convinced him to come back to the hotel and join the fun. 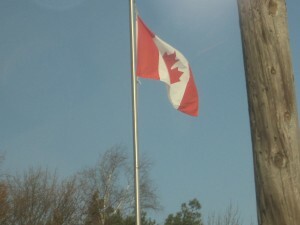 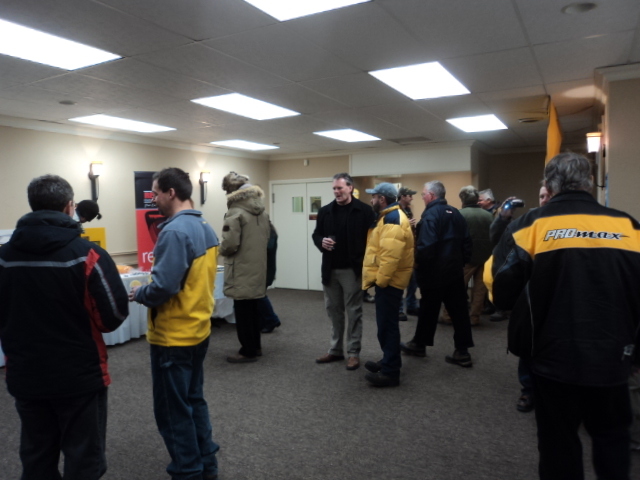 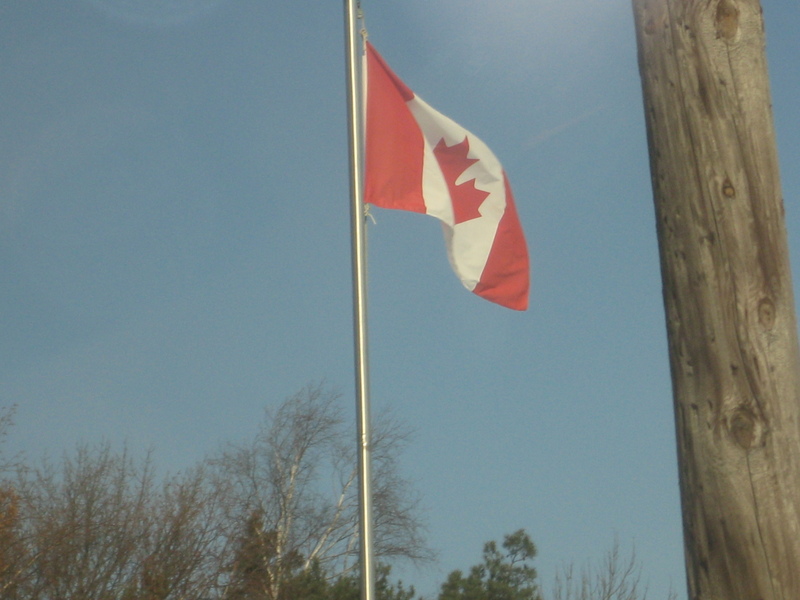 The weekend started with a Friday night Get Together at the Red Pine Inn in Alliston. 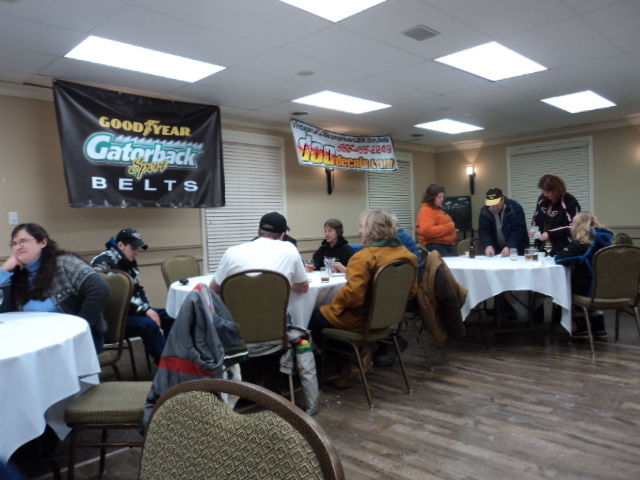 Enthusiasts from all over the US and Canada came and we hung out and chatted the evening away. A special guest for the weekend was Ed Mackisoc from Bath, Ontario. Ed was an original employee with Hus Ski and has been sharing many stories with us regarding those early years of Hus Ski. 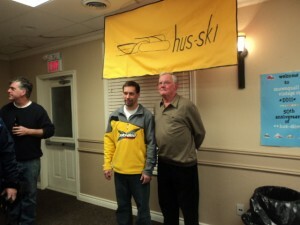 Ed is on the right below getting his picture taken with Mike Kneir from Jackson, Wisconsin. 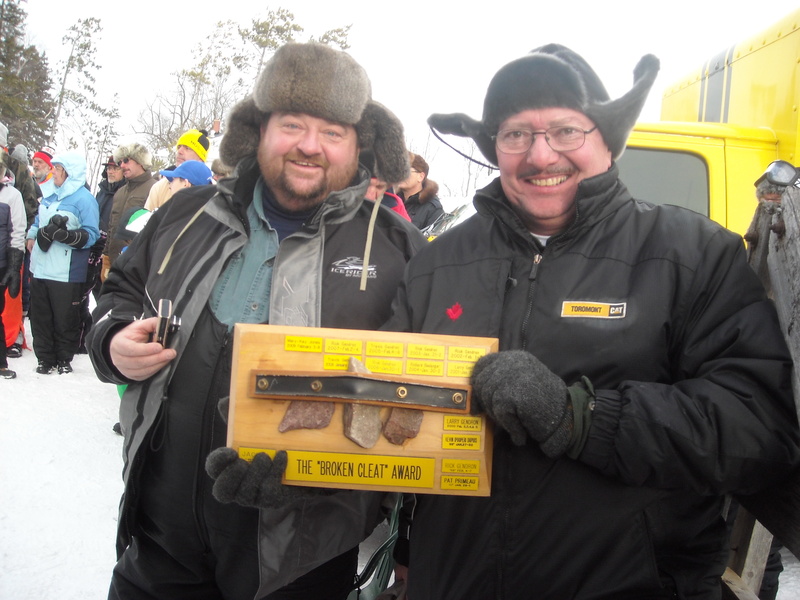 The Chalk River Gang brought their trophy’s to share and trinkets were available for your Hus Ski / Diablo fetish. 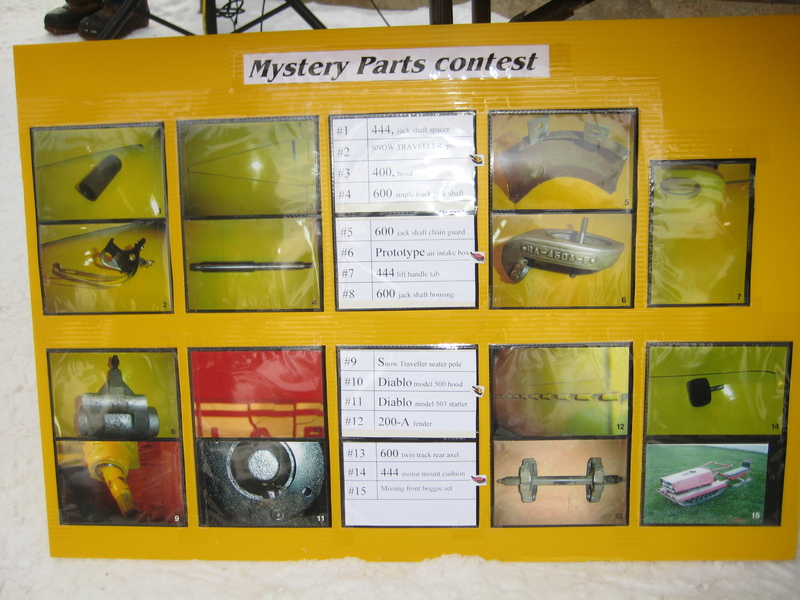 To get us primed up for the event, Barrie hosted a “Mystery Part” contest and posted machine specific pictures on the internet coaxing willing guesses from the masses of what each part was. 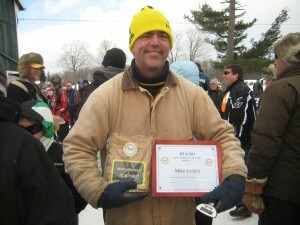 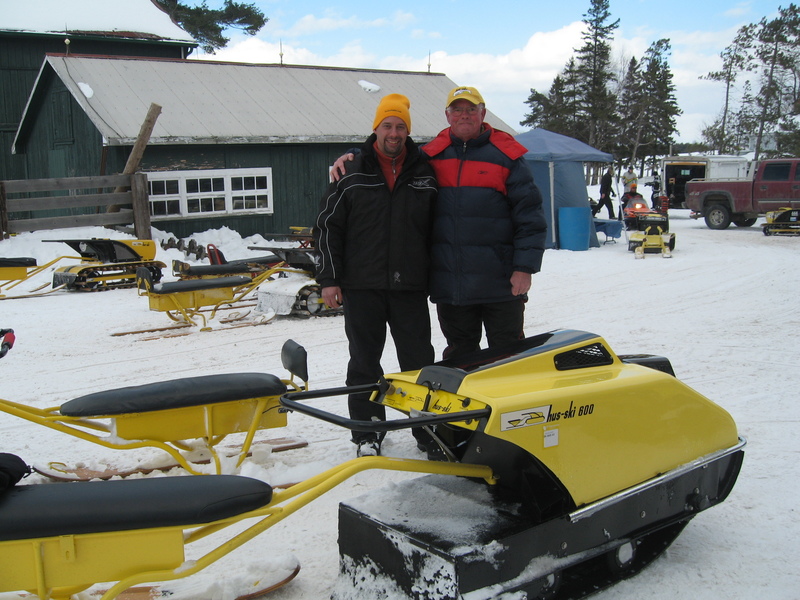 The winners of the contest were Mike Ledger from Milford, New Hampshire and Frank Paris from Gwinn, Michigan. 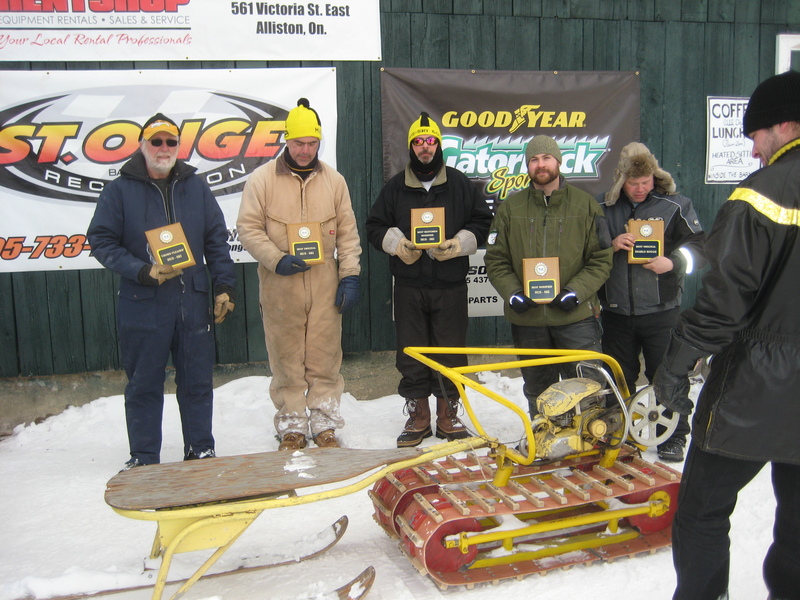 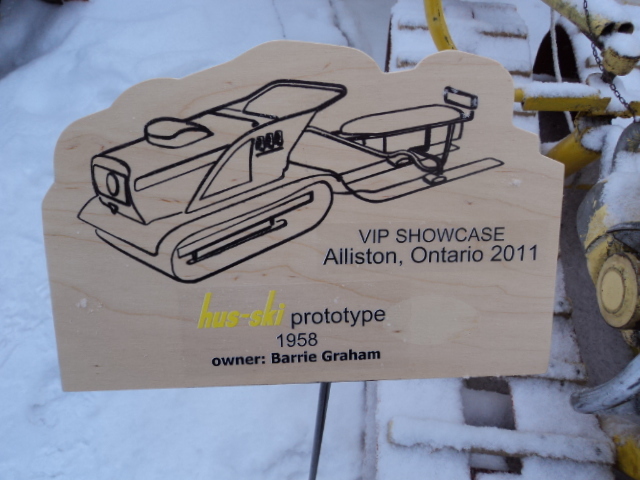 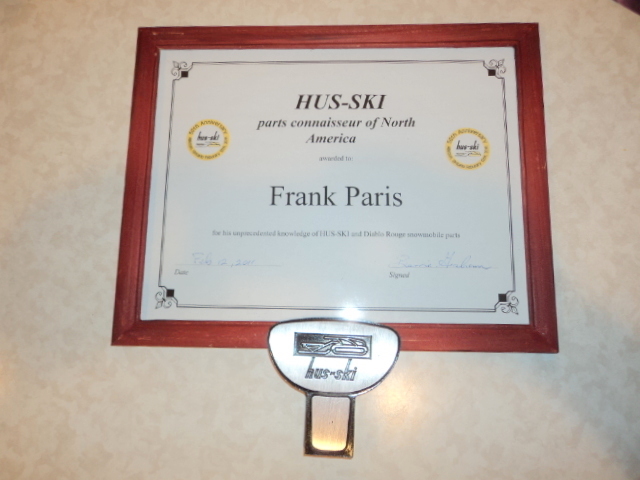 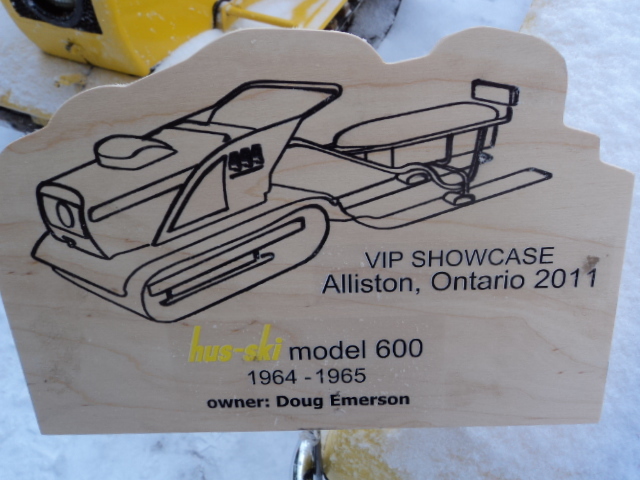 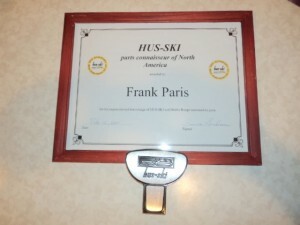 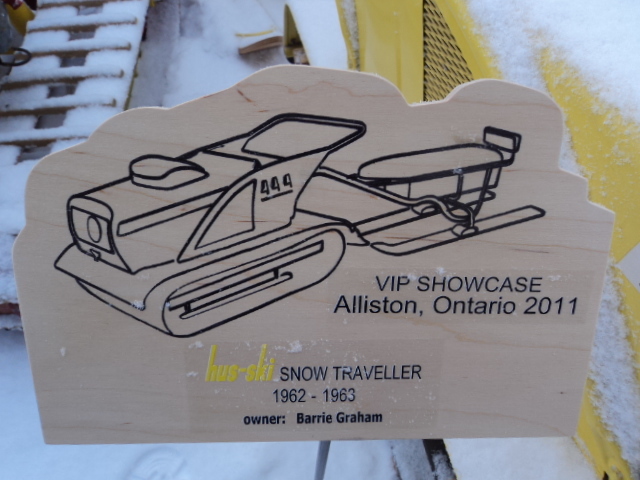 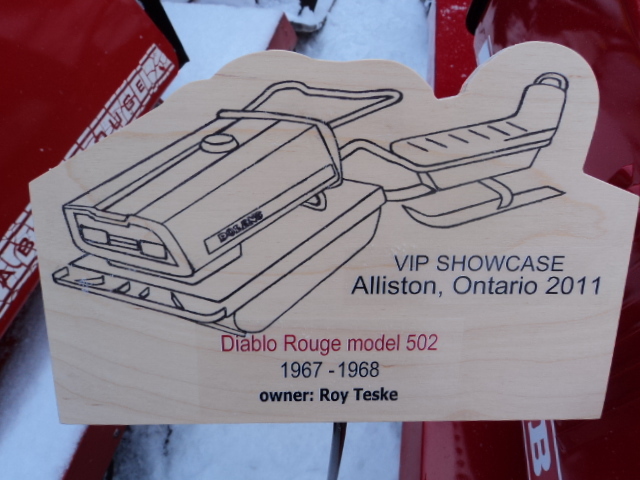 Barrie awarded each of them with the “Hus Ski Parts Connoisseur of North America” Award and a reproduction hood latch used on the early model Hus Skis. 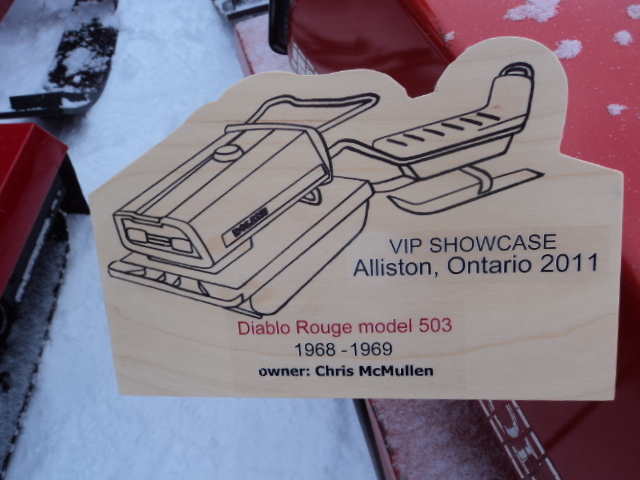 The following day began early in the morning with VIP parking for those of us bringing our Hus Skis and Diablos to the event. Jeff Cobb drove in the infamous “Hus Ski Hauler” and set the stage for a good day. 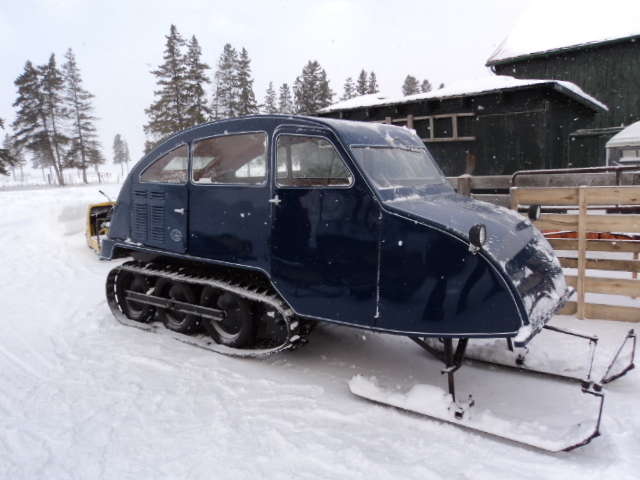 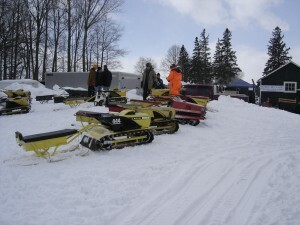 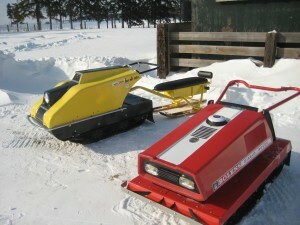 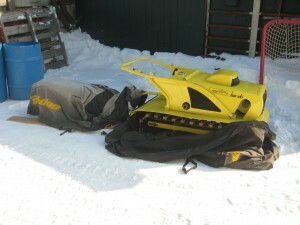 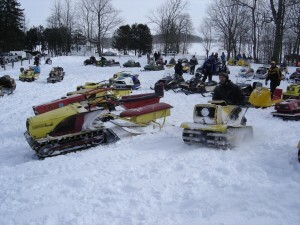 Many other unique snow vehicles joined the event too. A VIP Ring of Honor was set up with all the models of Hus Skis and Diablos. 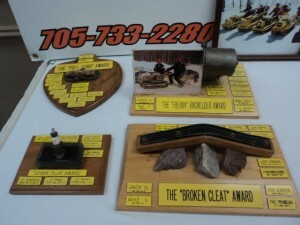 Many awards were also give out. 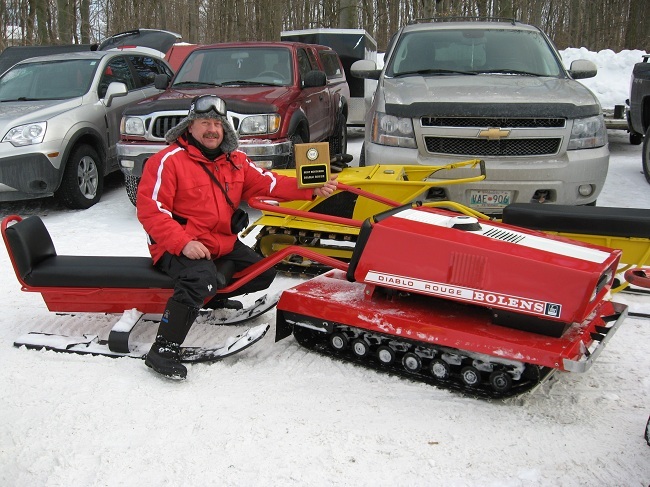 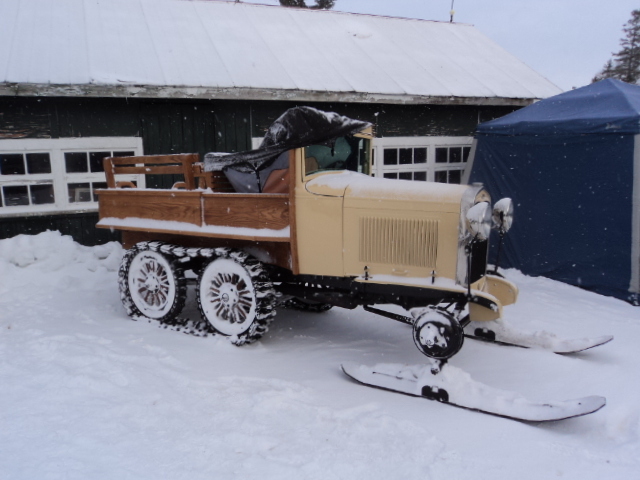 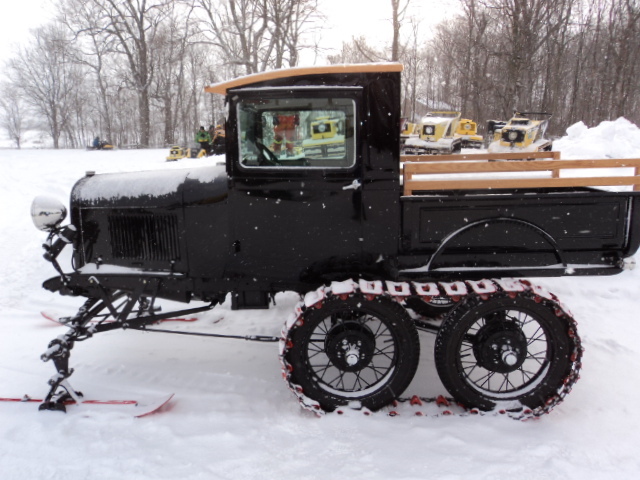 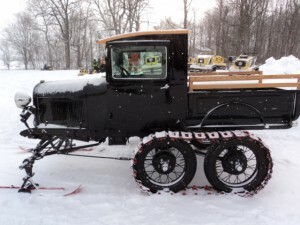 - Best original HUS-SKI……….Mike Ledger from Milford, New Hampshire for his model 200 in immaculate original condition including a complete set of “Powerflo Transmission” clutches. 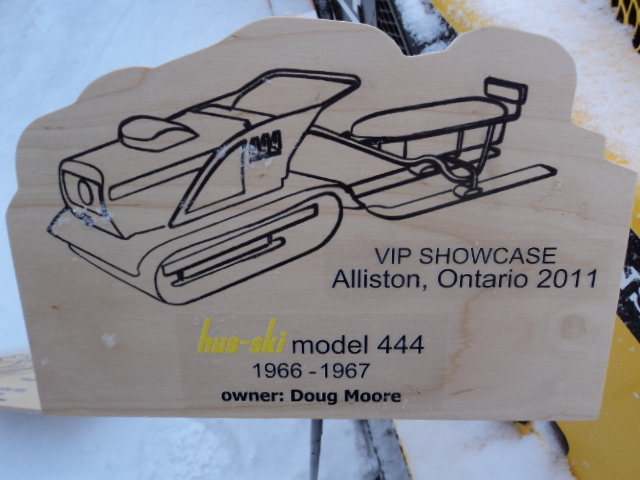 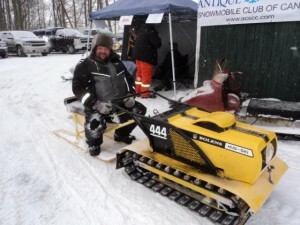 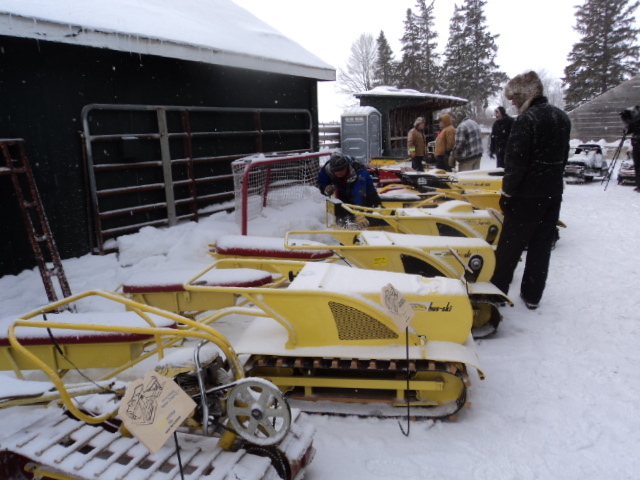 – Best Restored to Original HUS-SKI…….Sean Mullen from Finch, Ontario for his recent restoration of a Model 444 HUS-SKI. 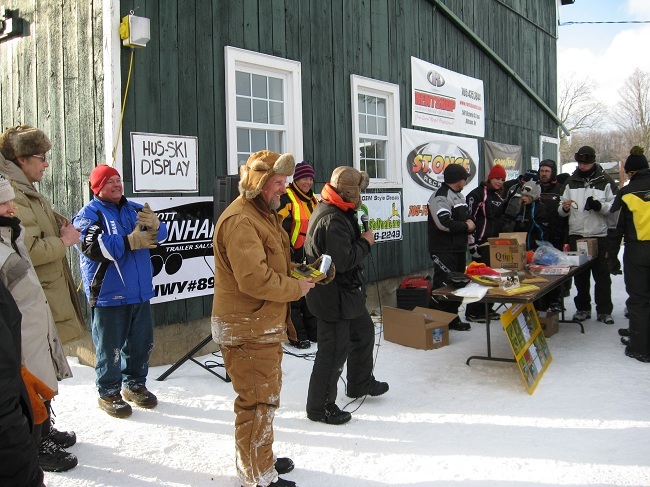 – Best Modified HUS-SKI………Justin Blimkie from Chalk River, Ontario for his installation of a 4 cycle Honda engine in a HUS-SKI SNOW TRAVELLER including an upgraded jack-shaft and gearing which gave him a top speed of 37 km/hour in the radar run. 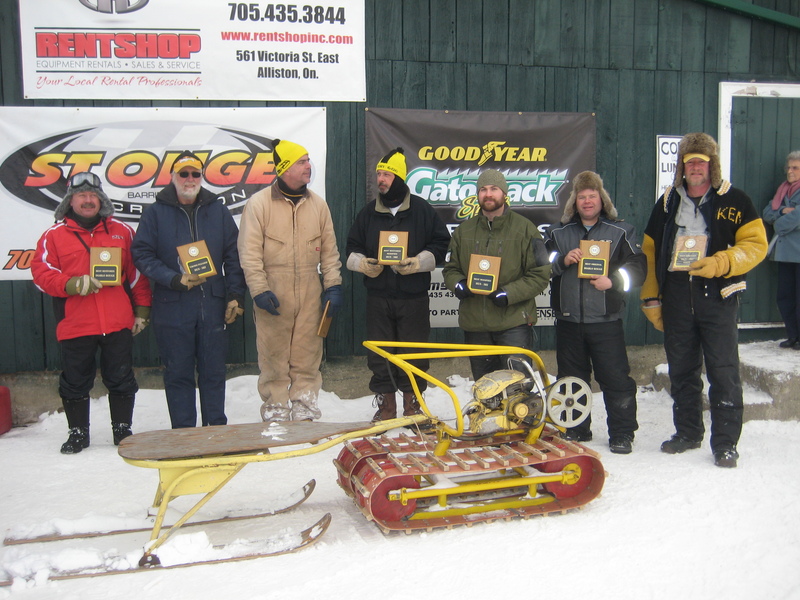 – Best restored Modified HUS-SKI…….Dave Barton from Unity, New Hampshire for his model 600 double track with a SACHS engine. 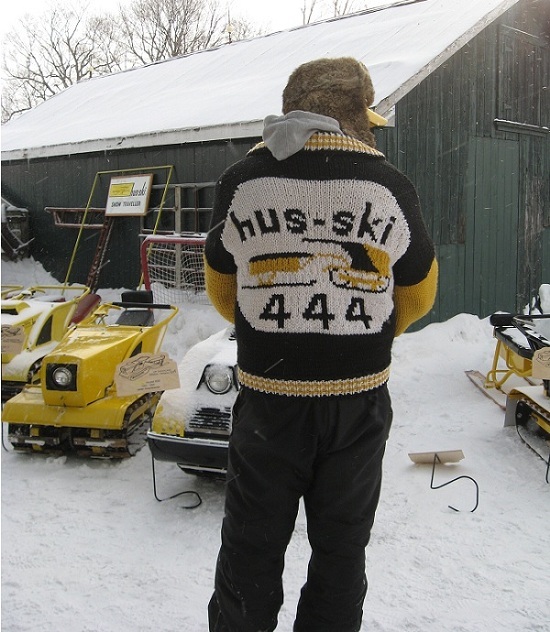 – Best Dressed HUS-SKI rider…….Ken Lunney from Little Britian, Ontario for his hand knitted HUS-SKI sweater and fur skin hat. 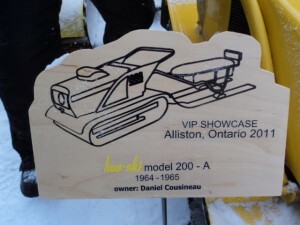 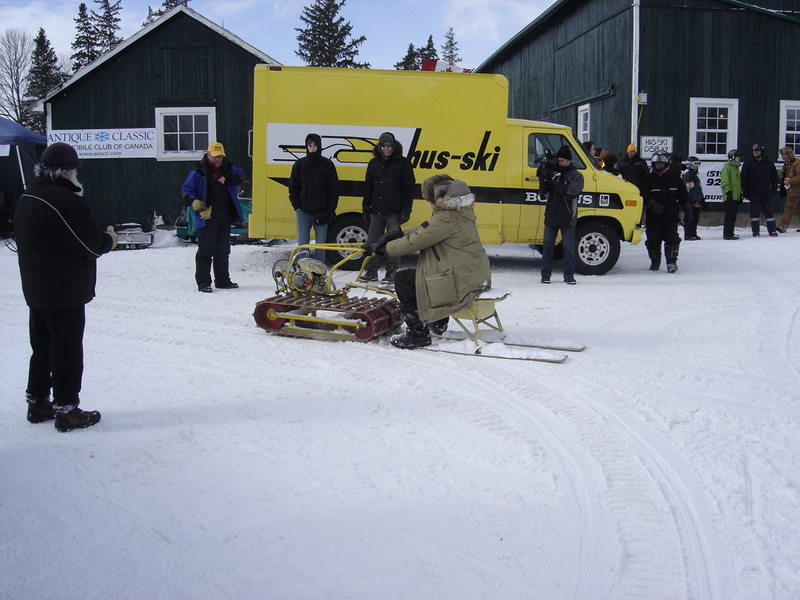 – “Crowd Pleaser” HUS-SKI…..Earl Ashby from Port Hope, Ontario for his HUS-SKI in John Deere green complete with chrome smoke stack. 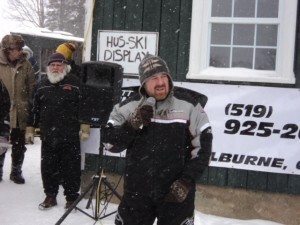 Spark Plug Award to Carl Murray. 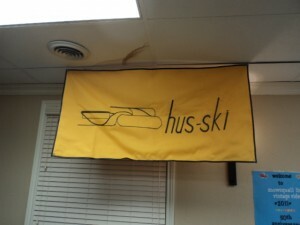 Rarely his Hus Ski 444 with the 292 in it ever started on one, two, or even three pulls. It was usually a pull, another pull, another pull, until the plug had to come out and the plugs changed 2 or 3 times before he was on his way (those darn HR carbs). Plus, if the piston is in the right/wrong spot with the kick back, there have been a few broken pull cord handles thrown in the ski-seater (eh Carl!). Pull Cord Award to Mike Ledger. 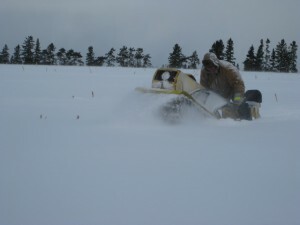 Pooper said Mike gave a mighty pull on his 444 and out came the wire rope. 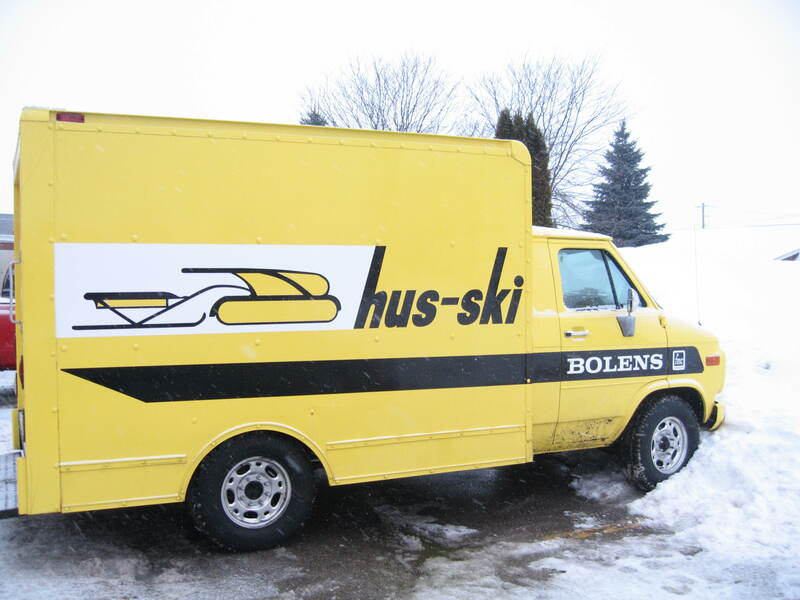 He must have encountered rewind problems before unlike anyone else who owns a Hus Ski. So, up goes the ski-seater ironing board and out comes another complete rewind ready to be bolted in. Honorable mention goes to Barrie Graham for abusing his poor little rewind on the West Bend in his Snow Traveller, but it still stayed together. Broken Cleat Award to Carl Hamlyn. 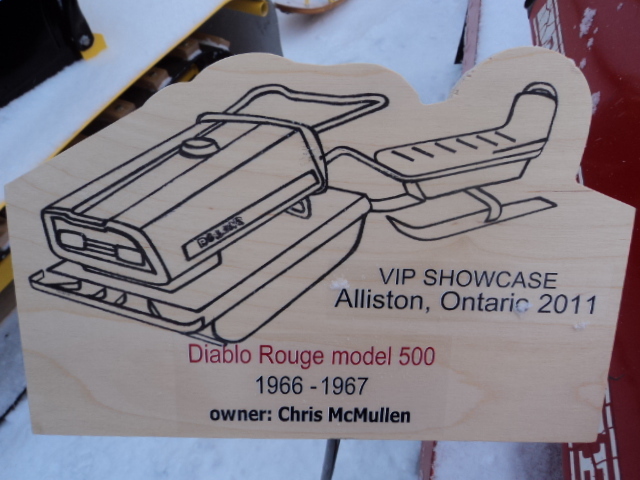 Doug Emerson was kind enough to lend one of his 5 Hus Ski/Diablo Rouges he had brought to Carl as Carl would have had a hard time fitting one of his own machines on the plane when he flew in from New Foundland. Doug was a little reluctant to lend Carl his favorite Diablo. All Doug said was “Carl, please take care of my baby”. 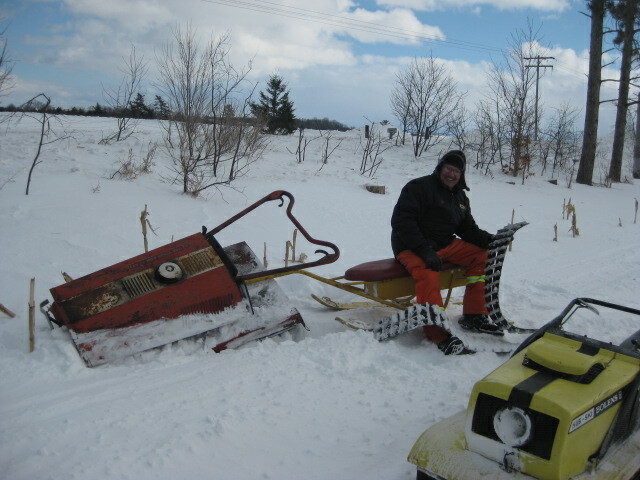 Well, he had managed to keep it one piece most of the day, until one set of tracks decided to leave his machine and Carl instantly took a little header over heelser. 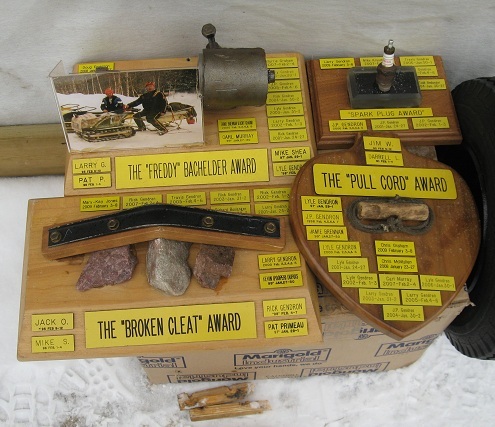 If your going to go for the broken cleat award, you may as well really go for it, eh Carl? 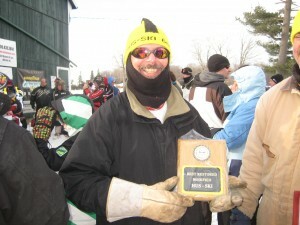 The Freddy Bachelor Award to Randy Lippert. 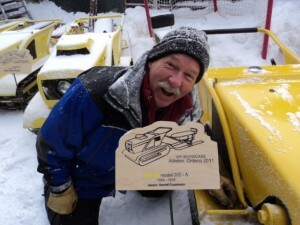 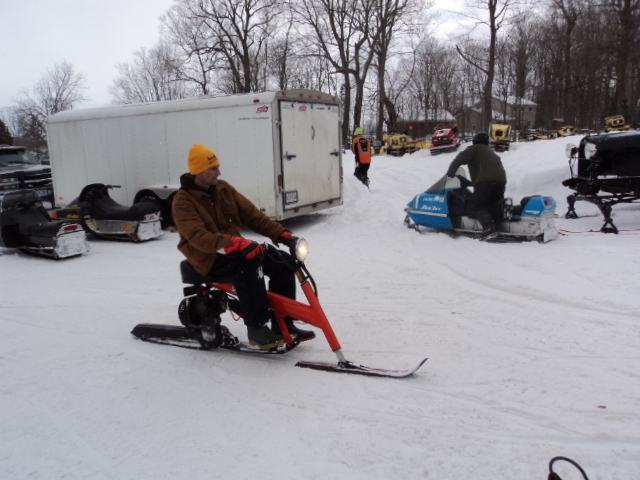 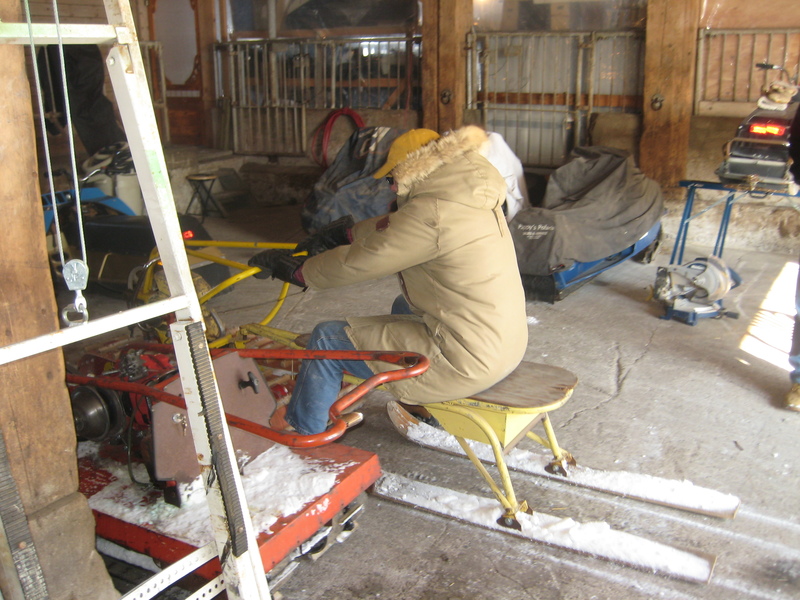 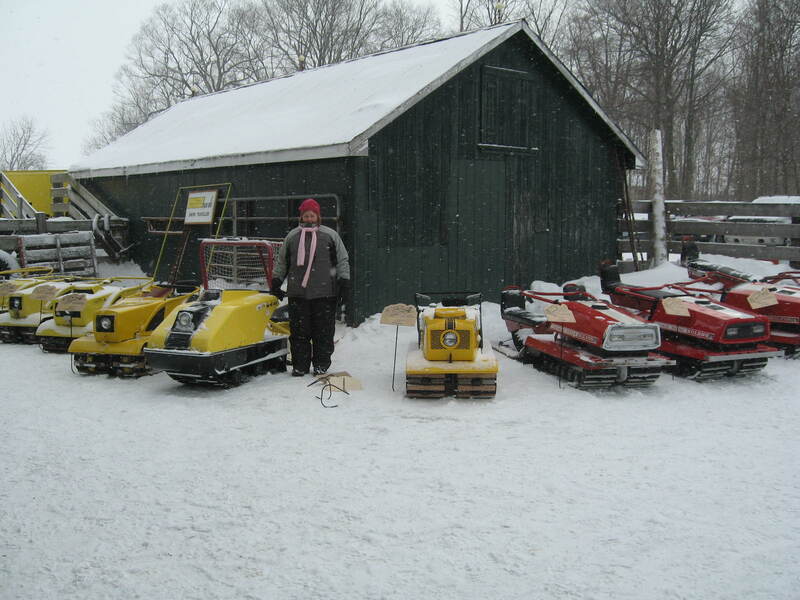 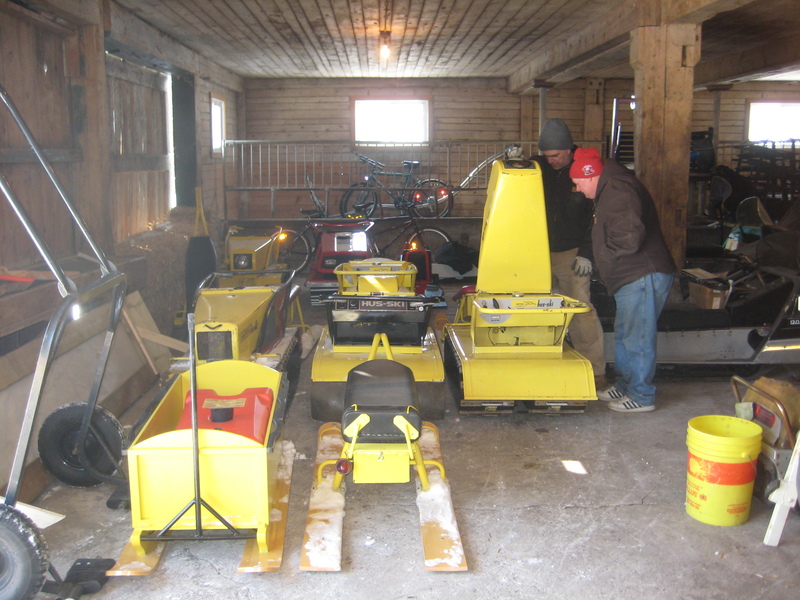 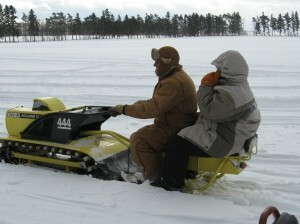 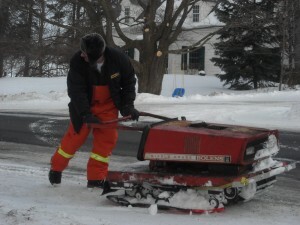 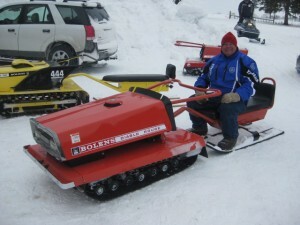 Randy was really revved up about his machine he was bringing to the 50th Anniversary Hus Ski Show. 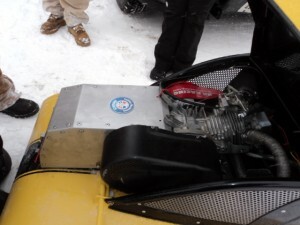 He took a model 600, yes indeed, a model 600 and put in a 13 hp high performance Champion, four stroke, electric start engine. As the beer was being consumed Friday night, Randy kept telling us over, and over, and over again “she isn’t pretty, but she’ll run nice”. 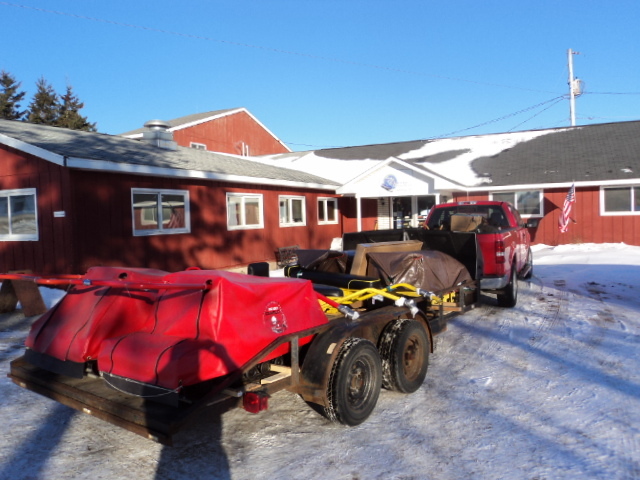 So next day she comes off the trailer. 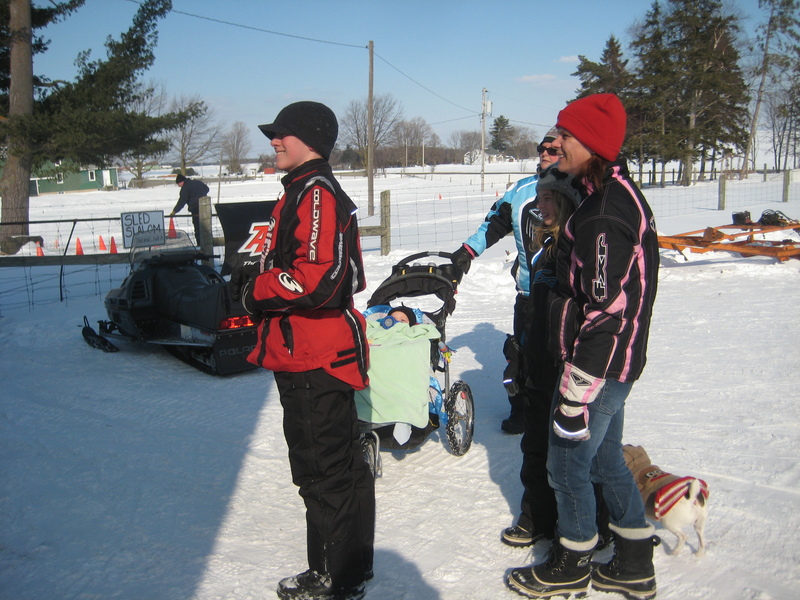 Justin, Randy, Pooper, and I go for a couple little pack runs and she is humming along like a wonderfully tuned Singer Sewing Machine. A little later on I say “hey guys, let’s go for a nice long run”. 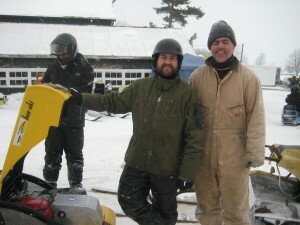 Everyone starts their Hus Ski and Randy is standing there with a sheepish/Hus Ski ish look on his face. Where is your machine Randy? “Uh ,well, it’s kinda back on the trailer” says Randy. 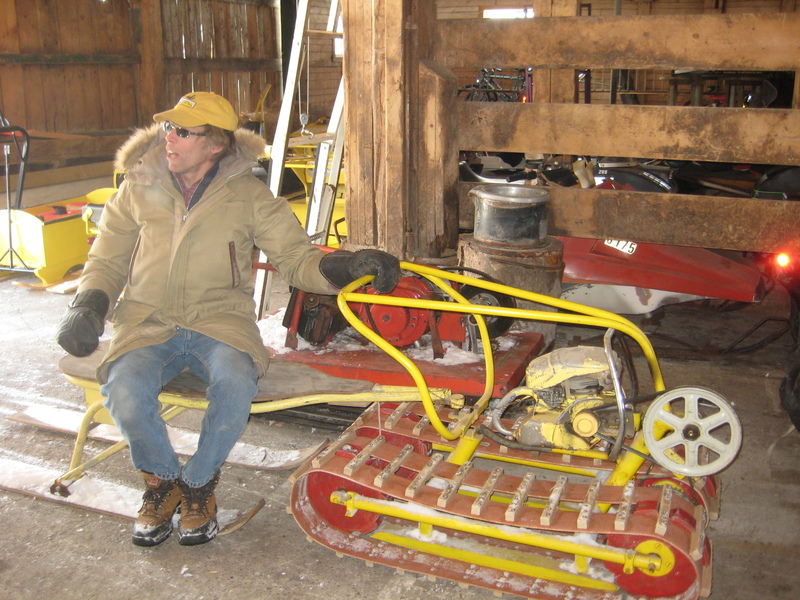 “‘My weld on my chain tensioner broke and it’s toast”. Oh man, you deserve the Freddie Bachelor. 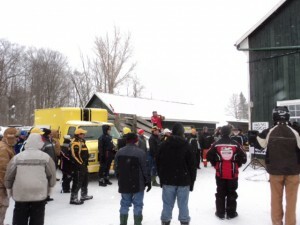 Snowmobile TV was on site and did multiple interviews and took many photos of the event. Later in the year, A DVD will be available to share. Toward the end of the day, we lined up every Hus Ski and Diablo we could find along with other sleds and took some pictures. Can you count how many Hus Skis and Diablos were there? 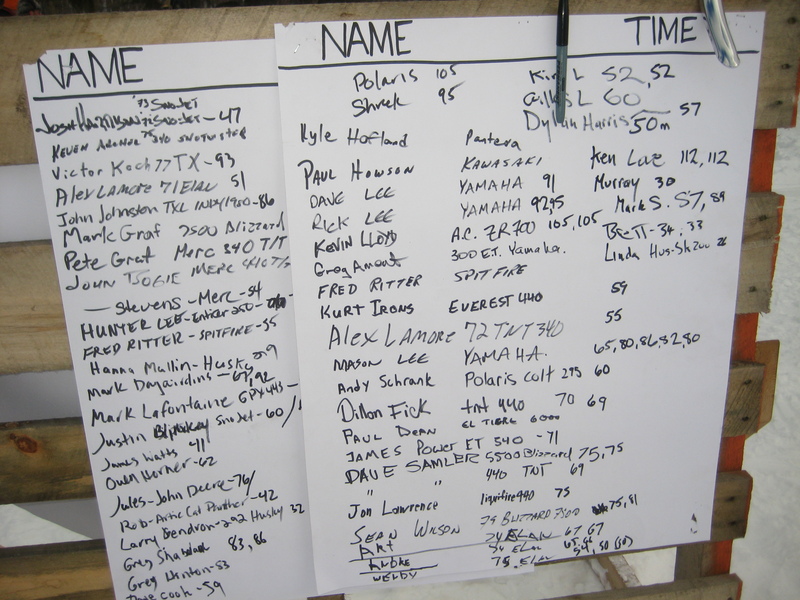 If you can, it is a miracle because we tried several times through the day to count and it was just impossible. 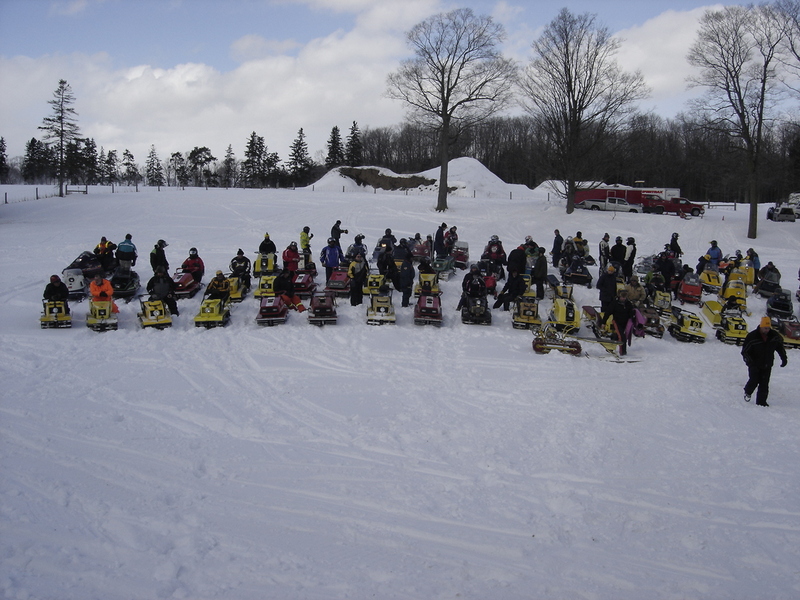 Hus Skis and Diablos were coming and going all day long and by the time we gathered everyone up, many had left already. 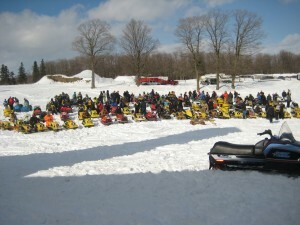 Other pictures of the event. 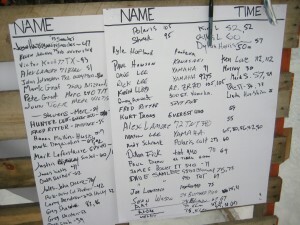 Thank you to all who shared your pictures for the website. 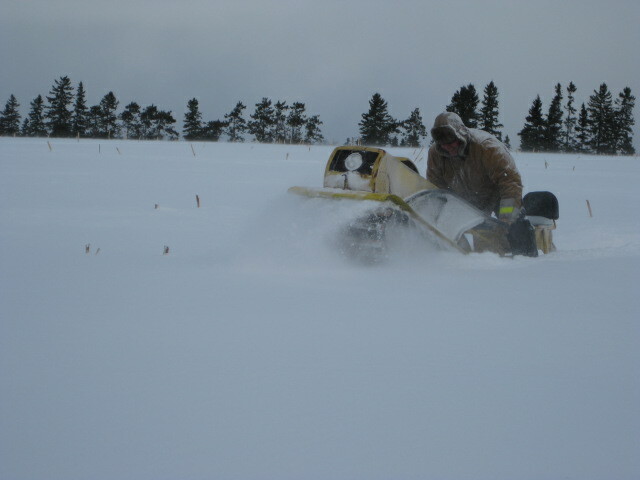 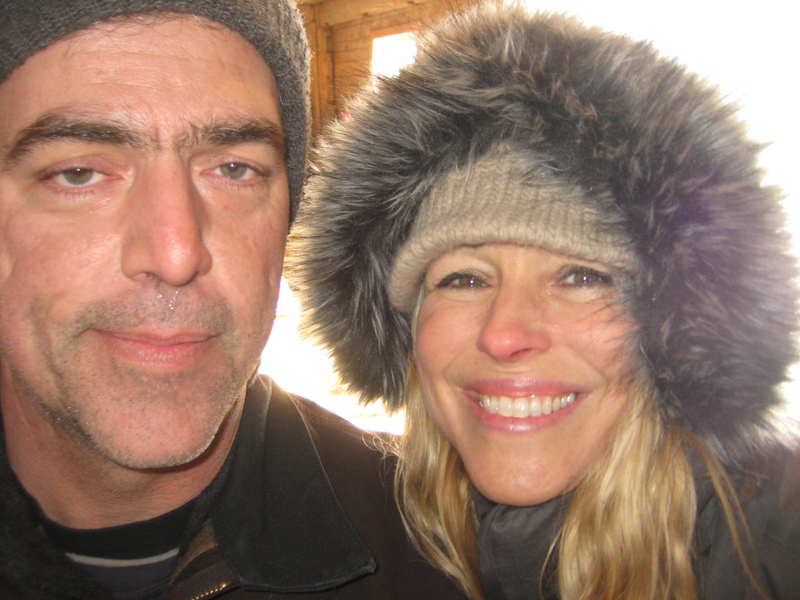 If you didn’t get enough yet, below is a link to many more pictures given to us by Jeff and his daughter Nicole. 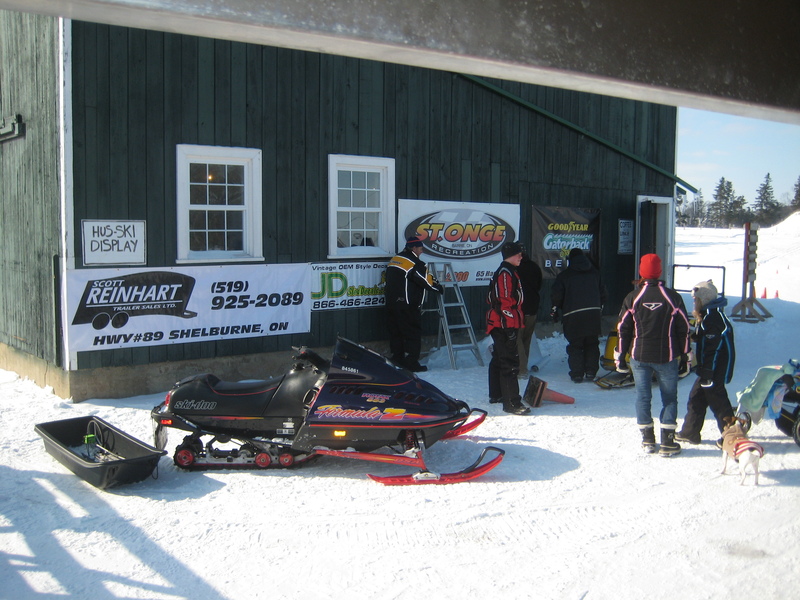 A special thanks out to Shawn and Tracy for their hospitality and friendship in putting this all together for us. 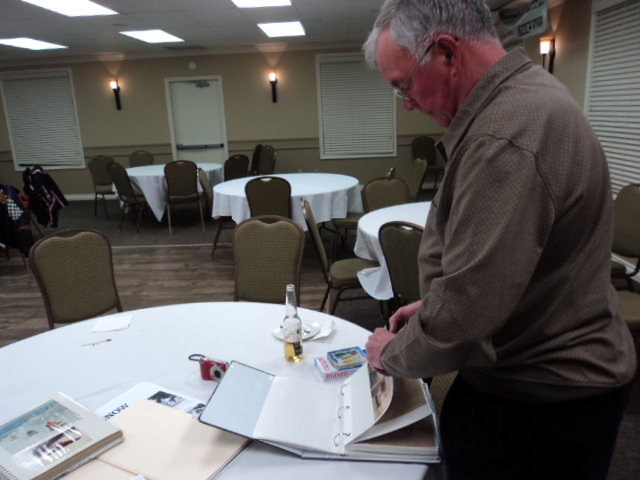 Also to Barrie for his vital role in making it an event to remember.